Kathleen Conway, who was named Rockville City Clerk/Director of Council Operations in 2016, is no longer in that position. Her deputy, Sara Taylor-Farrell, has been named Acting City Clerk by the Mayor and Council. The personnel change occurred outside of public view, most likely at an executive session on September 18. That session was closed to the public, but the agenda description specified that it was called to discuss issues related to the City Clerk position. Rockville Director of Communication Marylou Berg says that because the change is a personnel matter, the City has no further comment. A source with knowledge of the situation says the change was driven by the Team Rockville faction on the Council, which consists of Councilmembers Mark Pierzchala, Julie Palakovich Carr, and Virginia Onley. However, by the nature of a closed session, there is no way to officially corroborate that with the actual votes cast that day. But three votes would have been needed to make the change. There have been signs in the past of Team Rockville having an unknown political issue with Conway. She was excluded from a closed Mayor and Council session last November, after an offline agenda meeting that only included Pierzchala, City Manager Rob DiSpirito, and City Attorney Debra Yerg Daniel. When Mayor Bridget Donnell Newton and Councilmember Beryl Feinberg objected to Conway's exclusion, Team Rockville closed ranks to prevent Conway's attendance. "The personnel change occurred outside of public view, most likely at an executive session on September 18. That session was closed to the public, but the agenda description specified that it was called to discuss issues related to the City Clerk position." "However, by the nature of a closed session, there is no way to officially corroborate that with the actual votes cast that day. But three votes would have been needed to make the change." Why is this text even necessary? Sounds like somebody's sore about being scooped. The "text" was necessary because not everyone knows all of that information. Not every reader is following events at City Hall on a daily basis. That's the purpose of journalism - to inform. 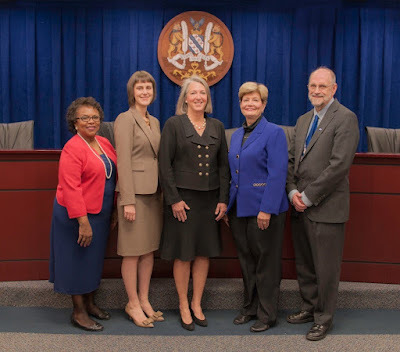 "the Team Rockville faction on the Council, which consists of Councilmembers Mark Pierzchala, Julie Palakovich Carr, and Virginia Onley"
Looks like this "secret team" is 3 of the 4 of the elected Council members. What exactly is sinister about this?